The California Indian man known to us today as “Ishi” is one of the most famous Native Americans of all time. Yet, ironically, we do not even know his true identity. Following Native Californian custom, he refused to divulge his personal name. Instead, he was referred to by the word that meant “man” in the language of his people, the Yahi. The southernmost group of Yana-speakers, the Yahi lived in the valleys and foothills east of the upper Sacramento River. A small group at European contact, their numbers declined precipitously through the nineteenth century due mainly to systematic attempts by settlers to eliminate them. Portrait of Ishi, April 1911 (15-5414). 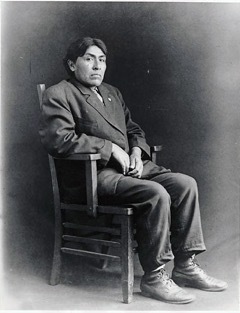 Ishi, born probably about 1860, spent most of his life in hiding with his family, avoiding the assaults of white settlers moving into Yahi territory. Finally, on 29 August 1911, Ishi walked into the nearby town of Oroville, CA. Apparently, all the members of his family, along with the rest of the Yahi, had perished. Not knowing how best to help Ishi, Oroville officials reached out the Hearst Museum, then known as the University of California Museum of Anthropology, for support. Within days, Ishi was brought to the Museum at its first location in San Francisco, where he lived for the next four and a half years. At the museum, Ishi was employed as a live-in custodian as well as a demonstrator of Yahi culture. He collaborated with the Museum’s director, Alfred L. Kroeber, and his assistants to document his Yahi culture. He spent much of his time fashioning exquisite projectile points of obsidian and colored glass, and recording Yahi song and stories on 148 wax cylinders. In 1914, Ishi traveled with the anthropologists back to his homeland, the Deer Creek valley area of Tehama County. 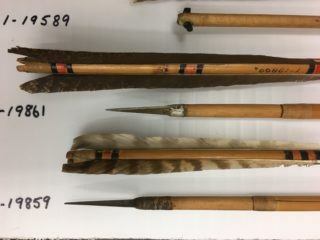 Arrows crafted by Ishi (1-19589, 1-19861, 1-19859). Ishi was known throughout San Francisco and could be found hunting on Mount Parnassus and walking in Golden Gate Park. First-hand accounts recall him making tools and sharing his knowledge with Museum visitors. Ishi passed away in March, 1916 from tuberculosis. The Museum still cares for the objects he made during his residency. Ishi and his life means different things to different people. A large number of books, and even plays, movies, and contemporary art exhibits have explored his life. We will never know as much as we would like and many of our questions remain unanswered.